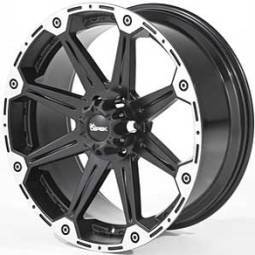 Introducing the M/T® Signature Series Wheels For Jeep Enthusiasts. This is a very special limited edition version of the world's best selling wheel for Jeep's. Only 640 Jeeps in the world will have this classic wheel because there will be only one production run of the new Mickey Thompson limited edition Signature Series wheel! 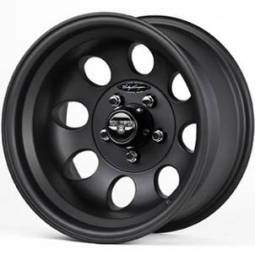 This stunning aluminum wheel offers Mickey Thompson's popular Classic II styling with a beautiful painted and clear coated satin black finish, a new black center cap with the Mickey Thompson logo, and an authentic Mickey Thompson signature badge. 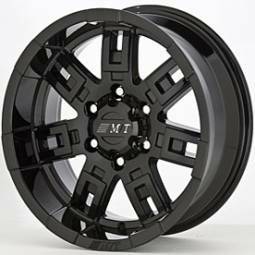 The new M/T Signature Series wheel will only be available in 15x8 and 15x10 sizes with a 5x4.5 Jeep bolt pattern. Introducing Mickey Thompson's new Pro-5 Drag Wheel line, All fully forged and CNC-machined drag racing wheels, offering the lightest practical weight and the greatest strength available from any aluminum wheel today. This new wheel line features styling cues from the original Mickey Thompson wheels sold in the 1960's, the polished 7.2 lb. 15x3.5-inch bolt-on front wheels have surpassed all 15.1 S.F.I. test specifications. The First one-piece Rear Drag Wheel with integrated Double-Bead lock system in the World. Lowest lateral and radial run-out in the industry. Lightest S.F.I. Certified Drag wheels in the world. No welding in the rim or the bead-lock components, eliminating warp and metal fatigue caused by heating and cooling. This performance wheel style is available in various back spacing. Please call for more information. Mickey Thompson Classic Lock simulated bead lock wheel features the same great styling as the Mickey Thompson Classic II wheel with an added bead lock-type ring, polished and embosed with large M/T logos givinig the look of a real bead lock without the expense. This is a great choice for 4x4 owners that are looking for off-road race or rock crawler styling. Street Legal With a Real Competition Look. M/T® Logo Embossed into Simulated Lock Ring. Highly Polished Surface. Valve Stem, Chrome Center Cap & Polished Ring Included. Mickey Thompson's Classic II Classic style wheels with highly polished finish and polished hand holes. M/T® stamped for quality. This popular truck wheel features: Highly Polished Surface, Hand Holes are Polished Inside For a More Distinctive and Attractive Look, High Load Rating, Chrome Center Cap Included.